We’ve blogged before about the difference between templates and content types. Templates are used to display content on GOV.UK. Content types (also known as formats) allow publishers to enter different kinds of information into GOV.UK publishing applications, depending on the kind of content. 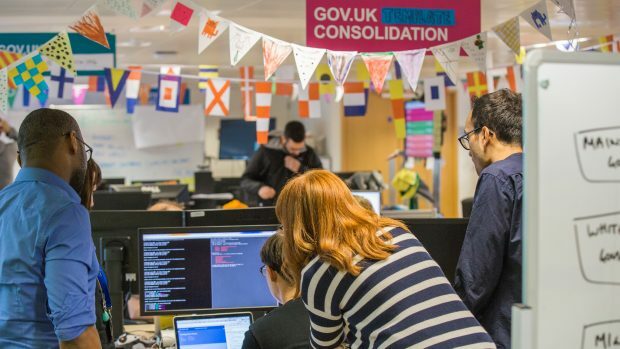 We’ve been working to reduce the number of templates used on GOV.UK to make it easier for our developers and designers to make changes and improvements. It will also create a more consistent experience for our users. Here’s an update of the work we’ve done. We first grouped content types by similarity in design across GOV.UK. This helped us compare the templates and find the similarities and differences, allowing us to consolidate them down into fewer templates. Our short text templates display 79 content types that usually have small to moderate amounts of content with navigation. These templates are currently used on pages that get about 50% of pageviews on GOV.UK. Consolidating the short text templates in our architecture has retired 3 frontend applications and reduced our dependency on another. We did this by creating 2 short text templates. The first is a generic short text template which is used by content types such as detailed guides, document collections and contact pages. The second is a multi page template, for content types like guides and travel advice. This means 79 content types now render from one frontend application and use the same design patterns in our 2 templates. This makes it simpler and faster for product teams to iterate on GOV.UK. As we were bringing different templates together, we needed to consider the variations in their designs. We updated the content list so that it only shows one or two levels depending on the type of content - as opposed to 3. We made this decision based on a review of how users had been interacting with content lists over time. We noted that mobile navigation across short text templates varied. Around 40% of our users use small screens so this was an important consideration. Content lists were displayed differently on mobiles and in some cases were hidden in an accordion structure. After testing with users, we introduced a consistent uncollapsed view of the content list and introduced a back to top button on all short text content types. By doing this, we helped to introduce consistent navigation on mobiles. We’ve also updated the metadata block which displays information about the content such as the organisation that published it and the date it was published. We’ve increased the font size and collapsed lists that are longer than 5 items. We did this because our device lab testing showed that the text was too small for user on mobiles, and the metadata block can get very long. This work has delivered a consistent user experience on mobile and made it more accessible for all. We’re excited by this year's roadmap. The short text templates will be getting further improvements from other teams. Our work has allowed us to iterate faster in one application and make consistent design changes, so that all users can benefit. Humin is an associate product manager on GOV.UK. You can follow him on Twitter.